Sabbati, 11 die Maii, 1661. A Member makes his Election. 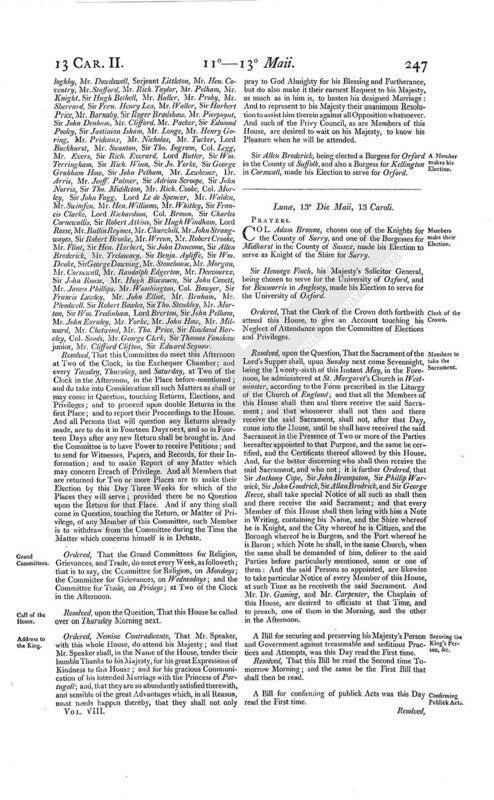 Ordered, That a new Writ do issue out for the Election of a new Burgess for Liscard; and that Mr. Speaker do make a Warrant to the Clerk of the Crown, to issue a Writ accordingly. Ordered, That a new Writ do issue for the chusing of a Burgess in the Place of the Lord Hollis, being now a Peer, who was returned one of the Burgesses for Dorchester in the County of Dorsett; and that Mr. Speaker do make a Warrant to the Clerk of the Crown to issue a Writ accordingly. Ordered, That Mr. Speaker do make out Warrants to the Clerk of the Crown, to issue out new Writs for new Elections in such Places as hereafter shall be waved by any Members who are returned for several Places, or shall otherwise become void. Ordered, That, upon all double Returns of Members, none do sit, till their Returns be determined, excepting such only as are returned in all Indentures. Ordered, That a Committee of Elections and Privileges be appointed of the Members following; Sir George Carteret Knight, Sir Wm. Morrice Secretary, Sir Edward Hungerford, Lord Ancram, Lord Mandevill, Mr. Weld, Sir George Probert, Sir Richard Oatley, Sir Wm. Strowd, Sir Hump. Winch, Earl of Newburgh, Mr. Rich. Spencer, Mr. Crouch, Mr. Edward Boscawen, Sir John Barrington, Mr. Edward Phillips, Mr. Henry Seymore, Sir Henry North, Mr. Marvill, Sir Rich. Maliverer, Sir Morrice Barckley, Mr. Street, Sir Rich. Ford, Mr. Rigby, Mr. Tulse, Mr. James Harbert, Sir Hen. Lea, Sir Rich. Breham, Sir Ralph Hare, Mr. Cotton, Sir Tho. Hebblethewait, Mr. Collins, Mr. Goodderick, Mr. John Ashburnham, Mr. Denny Ashburnham, Mr. Phineas Andrewes, Mr. Peckham, Sir Tho. Payton, Sir Rich. Fanshaw, Sir Tho. Fanshaw, Sir John Dawney, Sir Wm. Lewes, Mr. Laurence Hide, Mr. Jonathan Trelawney, Dr. Burrell, Dr. Craddock, Sir Gervas Cliffton, Sir John Holland, Sir John Harrison, Sir John Strangwayes, Mr. Stanley, Sir Robert Holt, Sir Hen. Capell, Sir Baynam Throgmorton, Mr. Mallet, Sir Rich. Inglesby, Mr. Giles Strangwayes, Mr. John Newton, Sir John Bramston, Mr. Manwaring, Sir Hen. Lingham, Col. Windham, Mr. James Scudamore, Sir Jorden Crosland, Mr. Will. Lowther, Mr. Arthur Stanhope, Sir Solomon Swale, Sir Phillip Warwick, Sir John Goodderick, Sir Phillip Musgrave, Serjeant Charlton, Sir Thomas Leigh, Mr. Lewes Palmer, Mr. Thurland, Lord St. John, Mr. Pendarvis, Sir George Reeve, Mr. Vaughan, Sir Heneage Finch, Mr. Wm. Mountague, Sir Tho. Meeres, Sir Tho. Strickland, Lord Mansfeild, Sir Hen. Puckering alias Newton, Lord Bruce, Sir Rich. Onslow, Mr. George Mountague, Sir John Norton, Sir James Smith, Col. Fretchvile, Sir Allen Apsley, Mr. Wm. Coventry, Sir Hugh Pollard, Sir John Roll, Sir Wm. Doyley, Sir Jo. Hotham, Mr. Waring, Sir AnthoCope, Mr. Tho. Chichely, Sir Tho. Dolman, Mr. Glascocke, Mr. Anthony Eyre, Mr. Wm. Sandis, Sir John Tuffton, Mr. Coventry, Col. Gilby, Lord Cornbury, Mr. Hide, Sir John Nicholas, Mr. Strickland, Mr. Crymes, Mr. Darcy, Sir Wm. Hartope, Sir Wm. Bowyer, Sir George Sondis, Mr. Edward Seymour, Lord Fawlkland, Sir John Burlacy, Sir Ralph Bankes, Mr. Noell, Mr. Orme, Mr. Heath, Mr. Goddard, Sir Tho. Bloodworth, Col. Kyrkby, Mr. Giles Hungerford, Sir Gilbert Ireland, Sir Chichester Wray, Sir Wm. Compton, Sir George Stonehouse, Sir John Packington, Sir Nicho. Crysp, Sir Edmond Peirce, Sir Hump. Bennet, * Phillips, Sir John Talbott, Mr. Tomkins, Sir Francis Vincent, Mr. John Stroud, Mr. Shawe, Mr. Whitaker, Sir Rich. Temple, Sir Wm. Fleetwood, Sir Lanclot Lake, Mr. Onslow, Mr. Windham, Sir George Fletcher, Sir Tho. Widdrington, Mr. George Fane, Sir Robert Howard, Sir Wm. Smith, Mr. Ed. Smith, Mr. Bulckley, Mr. Pytt, Sir Ed. Wallpoole, Mr. Wm. Gawdy, Mr. Henley, Mr. John Bennet, Sir Wm. Whitmore, Mr. John Lowther, Lord Wil loghby, Mr. Dowdswell, Serjeant Littleton, Mr. Hen. Coventry, Mr. Stafford, Mr. Rich. Taylor, Mr. Pelham, Mr. Knight, Sir Hugh Bethell, Mr. Buller, Mr. Proby, Mr. Sherrard, Sir Fran. 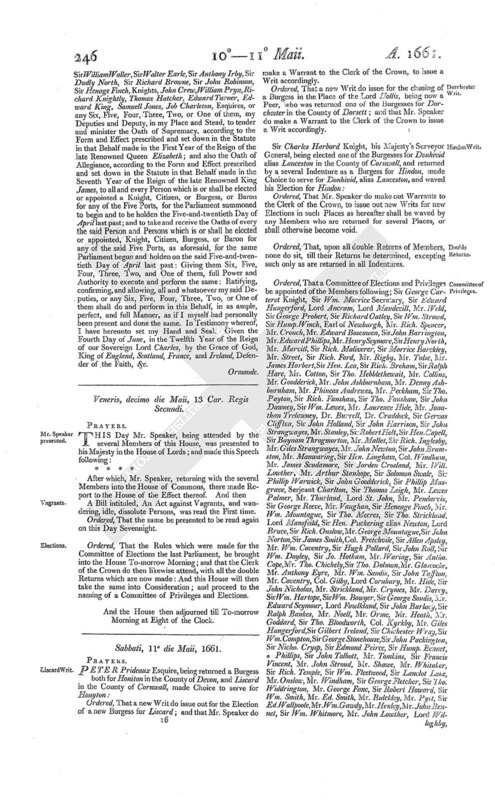 Henry Lea, Mr. Waller, Sir Harbert Price, Mr. Barnaby, Sir Roger Bradshaw, Mr. Pierpoynt, Sir John Denham, Mr. Clifford, Mr. Packer, Sir Edmond Pooley, Sir Justinian Isham, Mr. Longe, Mr. Henry Goring, Mr. Prideaux, Mr. Nicholas, Mr. Tucker, Lord Buckhurst, Mr. Swanton, Sir Tho. Ingram, Col. Legg, Mr. Evers, Sir Rich. Everard, Lord Butler, Sir Wm. Terringham, Sir Rich. Winn, Sir Jo. Yorke, Sir George Grubham How, Sir John Pelham, Mr. Lewkener, Dr. Arris, Mr. Jeoff. Palmer, Sir Adrian Scroope, Sir John Norris, Sir Tho. Middleton, Mr. Rich. Cooke, Col. Morley, Sir John Fagg, Lord Le de Spencer, Mr. Walden, Mr. Swimfen, Mr. Hen. Williams, Mr. Whitley, Sir Francis Clarke, Lord Richardson, Col. Brown, Sir Charles Cornewallis, Sir Robert Atkins, Sir Hugh Windham, Lord Rosse, Mr. Bullin Reymes, Mr. Churchill, Mr. John Strangwayes, Sir Robert Brooke, Mr. Wrenn, Mr. Robert Crooke, Mr. Flint, Sir Hen. Harbert, Sir John Duncome, Sir Allen Broderick, Mr. Trelawney, Sir Benja. Ayliffe, Sir Wm. Drake, Sir George Downing, Mr. Stonehouse, Mr. Morgan, Mr. Cornewall, Mr. Randalph Edgerton, Mr. Deavourex, Sir John Rouse, Mr. Hugh Biscawen, Sir John Covett, Mr. James Phillips, Mr. Wasshington, Col. Bowyer, Sir Francis Lawley, Mr. John Elliot, Mr. Braham, Mr. Pleadwell, Sir Robert Bowles, Sir Tho. Stewkley, Mr. Morton, Sir Wm. Tredinham, Lord Brerton, Sir John Pelham, Mr. John Earnley, Mr. Yorke, Mr. John How, Mr. Milward, Mr. Chetwind, Mr. Tho. Price, Sir Rowland Barcley, Col. Sands, Mr. George Clerk, Sir Thomas Fanshaw junior, Mr. Clifford Clifton, Sir Edward Seymor. Resolved, That this Committee do meet this Afternoon at Two of the Clock, in the Exchequer Chamber; and every Tuesday, Thursday, and Saturday, at Two of the Clock in the Afternoon, in the Place before-mentioned; and do take into Consideration all such Matters as shall or may come in Question, touching Returns, Elections, and Privileges; and to proceed upon double Returns in the first Place; and to report their Proceedings to the House. And all Persons that will question any Returns already made, are to do it in Fourteen Days next, and so in Fourteen Days after any new Return shall be brought in. And the Committee is to have Power to receive Petitions; and to send for Witnesses, Papers, and Records, for their Information; and to make Report of any Matter which may concern Breach of Privilege. And all Members that are returned for Two or more Places are to make their Election by this Day Three Weeks for which of the Places they will serve; provided there be no Question upon the Return for that Place. And if any thing shall come in Question, touching the Return, or Matter of Privilege, of any Member of this Committee, such Member is to withdraw from the Committee during the Time the Matter which concerns himself is in Debate. Ordered, That the Grand Committees for Religion, Grievances, and Trade, do meet every Week, as followeth; that is to say, the Committee for Religion, on Mondays; the Committee for Grievances, on Wednesdays; and the Committee for Trade, on Fridays; at Two of the Clock in the Afternoon. Resolved, upon the Question, That this House be called over on Thursday Morning next. Ordered, Nemine Contradicente, That Mr. Speaker, with this whole House, do attend his Majesty; and that Mr. Speaker shall, in the Name of the House, tender their humble Thanks to his Majesty, for his great Expressions of Kindness to this House; and for his gracious Communication of his intended Marriage with the Princess of Portugall; and, that they are so abundantly satisfied therewith, and sensible of the great Advantages which, in all Reason, must needs happen thereby, that they shall not only pray to God Almighty for his Blessing and Furtherance, but do also make it their earnest Request to his Majesty, as much as in him is, to hasten his designed Marriage: And to represent to his Majesty their unanimous Resolution to assist him therein against all Opposition whatsoever. And such of the Privy Council, as are Members of this House, are desired to wait on his Majesty, to know his Pleasure when he will be attended. Sir Allen Broderick, being elected a Burgess for Orford in the County of Suffolk, and also a Burgess for Kellington in Cornwall, made his Election to serve for Orford.